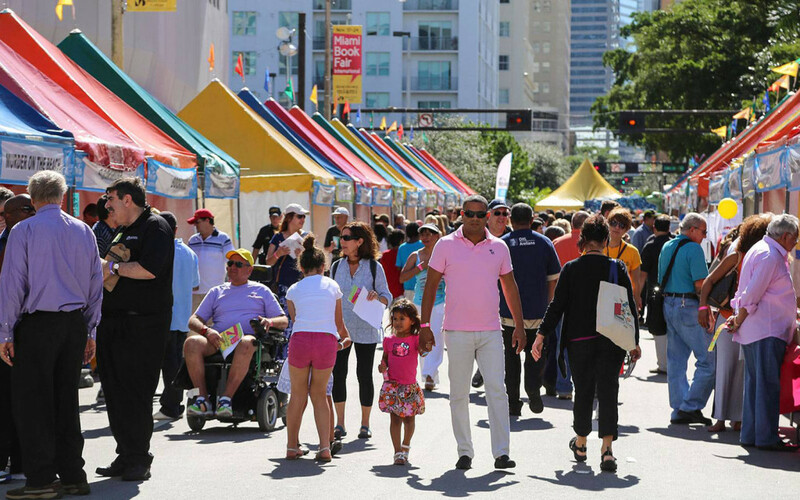 Celebrate the annual Miami Book Fair with author events, a street fair and live entertainment. The 2018 Miami Book Fair takes place from November 11 to 18 in Downtown Miami on the campus of Miami Dade College. The annual event draws hundreds of authors and literary luminaries to Miami for lectures, readings, panel discussions and a street fair. Originally founded in 1984 by the president of Miami Dade College and the owner of local indie bookstore Books & Books, its become one of the worlds premier book festivals. The bulk of Miami Book Fairs programming takes place on Saturday and Sunday November 17 and 18 when the Street Fair is in full effect and over 500 authors converge for dozens of events scheduled across the campus. Highlights this year include Supreme Court Justice Sonia Sotomayor, John Grisham, Carl Hiaasen, Gary Shteyngart, Billy Collins, Michael Ondaatje, Edwidge Danticat, Sandra Cisneros, Abbi Jacobson, Kevin Young, Rebecca Traister, Adam Gopnick and so many more. The fairs programming concludes with a free ticketed event with John Kerry and his book Every Day is Extra on Sunday evening at 6 p.m. in the Chapman auditorium. The Evenings With Series act as a prelude to the fairs weekend when high profile authors command a large audience. These are ticketed events that often sell out fast, so if theres someone you want to see, get your tickets while theyre hot! This years An Evening With Series will feature Tina Brown, Anna Quindlen, Ngugiwa Thiongo, Liane Moriarty, Laura Esquivel, Tayari Jones, Lawrence Wright and others. The series concludes Friday night with An Evening with the National Book Awards Winners and Finalists in fiction, nonfiction and poetry. The Street Fair takes place Friday through Sunday, November 16 to 18 when hundreds of literary exhibitors line the streets of downtown Miami, ranging from booksellers to small presses, literary journals, magazines, festivals and authors. Youll also find plenty of great food options with multiple food courts and vendors throughout the grounds. During the course of the Miami Book Fair, you can also enjoy film screenings, musical performances, improv comedy, dance parties, puppetry and many other fun activities. Theres always programming and authors events in Spanish, as well. While the Book Fair is held annually in November, theres also a year round component to its programming, bringing authors to Miami all year long. This programming includes creative writing workshops, a literacy initiative, events in Spanish and the annual Paz Prize for Poetry. Books & Books also serves as a year round literary light in Miami with author events held almost every day of the year at its locations in Coral Gables, South Beach, Downtown Miami and beyond.